Kwa-Zulu Natal. The family that raised him realised that he had become too big to continue living on their property and more importantly he deserved a chance to be returned to the wild. They were desperate to find somewhere suitable and felt the GCF’s cheetah rewilding program would be ideal for Zulu as he could help to achieve the foundation’s objectives of contributing to the greater cheetah population. The GCF stepped in and transported Zulu by plane down to Mossel Bay with the help of others so that he could begin a new life on Gondwana Game Reserve. Zulu will form part of the existing GCF cheetah program, joining Zee and Zimbini who were recently successfully released into the newly developed Mullersvlei portion of Gondwana. Mullersvlei is a large, protected portion of land that the GCF was able to include into the greater Gondwana conservancy with a particular focus on Cheetah conservation and rehabilitation providing them the opportunity to hunt and breed in safety. Zulu will initially be staying alongside Zera, another female cheetah, who continues to progress through her rehabilitation process within the foundation. Zulu’s arrival is however just the first step in his re-wilding. This is a process that will take a couple of years. In that time we need to feed him and train him to hunt and survive on his own. Just feeding Zulu will cost R2,000 a month. We will also need to hire a full time experienced guide to assist with implementing the re-wilding programme plus any veterinary care he may need along the way. After starting the initial phase of Zulu’s rewilding program it became evident that he unfortunately requires surgery to remove a tiny bone fragment from his shoulder which is a result of an injury he had as a juvenile in captivity. The bone fragment is causing severe discomfort and, if not dealt with, will prohibit him from being re-wilded. We are working with specialists for Zulu to undergo key-hole surgery to remove the fragment. The prognosis is very promising; however, it is going to cost a further R50 000. 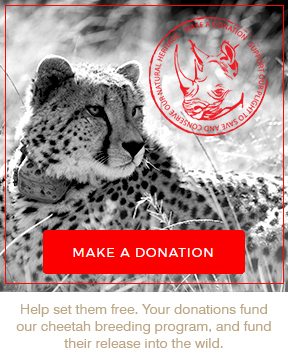 Ultimately, together with the surgery, we believe the Gondwana Conservation Foundation will need at least R475,000 for the ongoing cheetah re-wilding project. We are therefore about to launch an exciting new Crowdfund campaign through a platform called “Chuffed.org” to try and raise the funding required to achieve our goals. This is where we need your help. We are looking to recruit a number of ‘Zulu Warriors’, champions, that will help us tell as many people as possible about the campaign when it launches towards the end of the September. Zulu Warriors will help by spreading the message of the campaign to friends, family and colleagues prior to and post the launch through email, Facebook, twitter and word of mouth. We will keep our Zulu Warriors updated on the progress of the campaign and ask them to keep their Warriors up to speed. The most critical factor to success through the chuffed.org platform is that we hit launch day with a big bang to give the campaign momentum and working together we believe we can do this. This is why we are informing you of this fundraising initiative prior to it going live so that you can start recruiting potential donors now. We will then forward a similar communication the day the campaign goes live to generate as many donations on day 1 as possible as recommended by Chuffed.org to ensure success. All of our Zulu Warriors will receive regular updates on Zulu’s progress and access to unseen photo and video material. We would also like to give our top champions an opportunity to meet Zulu later in the year. email us saying “Yes, I’m in, I want to be a Zulu Warrior” and we will get back to you with the details of the campaign and launch. We look forward to hopefully hearing from you!